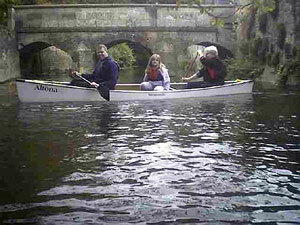 On a lovely moonlit night, Mary, Philip, Chris Pederson and I met to paddle down to the pub at Sandford. We managed it in double quick time, pace setting by Chris in his fibreglass tourer. The moon was reflected beautifully in the water and we could see for a good way. On the way back, we did it in half an hour! On a dry and medium-warm day, Roy, his daughter, Ruth, Rob, his son Danny, Stefan and I , set off fo a morning's trip up the Cherwell. We stopped once ot twicw on the way, to explore more fully some useful strokes like the 'J' and the power stroke, both children having a go too. We made good progress up to Magdalen College, where we stopped to let the children run around a little and have a snack. We then proceded round the back of the deer park, past the little weir and rejoined the main Cherwell by Magdalen Bridge, squeezing past the punts. Then down, past Magdalen College School cricket grounds and back down the Thames. On a lovely suuny morning, Stefan, Ken, Philip and I met to go up to Oseney lock and thence to circumnavigate Oseney Island. The river was up about 6 inches and running over the little weir under the Botley Road bridge with some decision. So , without too much scrabbling and scraping, over we all went. having reached the far left hand bend when one would normally proceed round the island, Philip spotted a hitherto inaccessable opening to the right. In true Philip style, this pointed to him the way to a yet unnavigated ditch, linking to the Botley Stream. We duly fought our way over pipes and concrete, eventually poling our way past debris etc to come out at the Binsey Lane bridge. Just passing Halfords, we spotted a rather good abandoned touring bike, whizzed over the fence and nestling in the nettles. We of course fought our way to it and liberated it from its discomfort, to rest cosily in Philip's boat and be offered a good home! 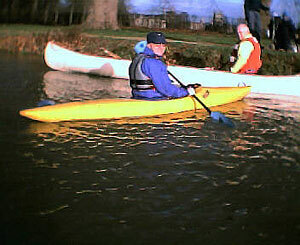 After that, plain sailing down the Botley Stream and then rejoining the Thames. All thoroughly enjoyed the morning.